ID Keys: Reddish chest on male, gray sides, black head with white collar, thin serrated bill. The Red-breasted Merganser is most often seen along coastlines of the U.S. in the winter, as they prefer to winter on salt-water (unlike the Common Merganser). They sometimes hunt cooperatively, forming lines to drive small prey fish into shallow water. 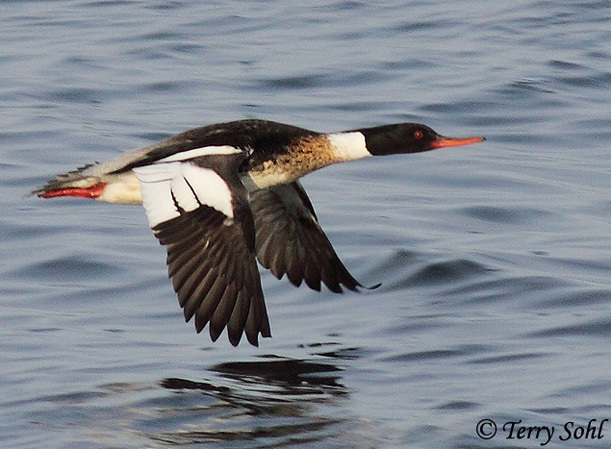 They are among the fastest of all flying waterfowl, reaching speeds of up to 100 mph. Habitat: During breeding season, they are found around lakes and rivers in the forests of Northern North America, northward into the tundra. During winter, they are primarily found on coastal waters, with smaller numbers on inland waters if they are ice-free. Diet: Feeds primarily on small fish. Will also take crustaceans, aquatic insects, frogs, and tadpoles. Behavior: Feeds by diving and pursuing prey underwater. Occasionally Red-breasted Mergansers appear to cooperatively, collectively driving small fish to shallower water for easier capture. Song: Generally silent, although the courting male will make cat-like calls. 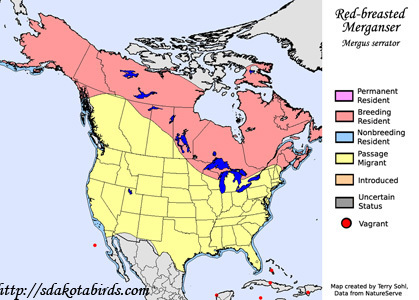 Migration: Summers throughout Alaska, much of Canada, the Great Lakes region, and New England. Winters along both the Atlantic and Pacific coasts of North America, with much smaller numbers over-wintering on the Great Lakes and other inland water bodies. Conservation Status: Current populations seem to be stable. South Dakota Status: Uncommon migrant in the eastern half of the state, rare migrant in the west. Rare winter visitor along the Missouri River.